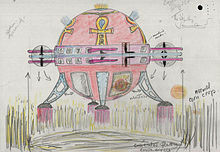 Unidentified flying object (commonly abbreviated as UFO or U.F.O.) is the popular term for any aerial phenomenon whose cause cannot be easily or immediately identified. Both military and civilian research show that a significant majority of UFO sightings have been identified after further investigation, either explicitly or indirectly through the presence of clear and simple explanatory factors. Most of the UFOs visiting this planet come from Mars and Venus. Most of them, even the Venusian ones, are made on Mars, which is a kind of great industrial planet. All of them are of subtle, etheric, not dense physical, matter. They can lower the vibrational rate of that matter until it comes within the range of our sight, so for a limited period they are visible. Normally, unless you have etheric vision, they would be invisible, but to the Martians, the Venusians and so on, they are visible because they are in that same kind of energy. If you went to Mars, you would see nothing, yet there are more people on Mars than on this planet. Their technology is thousands of years ahead of ours at the present time, but when we have the new Technology of Light, which will be as soon as the planet settles down, the principle of sharing is governing and there are no wars, the Technology of Light will give us all the energy we need directly from the sun... That will speed up our evolution tremendously from a technical point of view. Some years ago I had a conversation with a layman about flying saucers — because I am scientific I know all about flying saucers! I said "I don't think there are flying saucers'. So my antagonist said, "Is it impossible that there are flying saucers? Can you prove that it's impossible?" "No", I said, "I can't prove it's impossible. It's just very unlikely". At that he said, "You are very unscientific. If you can't prove it impossible then how can you say that it's unlikely?" But that is the way that is scientific. It is scientific only to say what is more likely and what less likely, and not to be proving all the time the possible and impossible. To define what I mean, I might have said to him, "Listen, I mean that from my knowledge of the world that I see around me, I think that it is much more likely that the reports of flying saucers are the results of the known irrational characteristics of terrestrial intelligence than of the unknown rational efforts of extra-terrestrial intelligence." It is just more likely. That is all. Anyway, I have to argue about flying saucers on the beach with people, you know. And I was interested in this: they keep arguing that it is possible. And that's true. It is possible. They do not appreciate that the problem is not to demonstrate whether it's possible or not but whether it's going on or not. When science progresses on various planes, then such visitations become less accidental and more planned. However, since the inhabitants of each plane are bound by the particular materialized patterns of their 'home,' they bring this pattern of camouflaged vitality with them. Certain kinds of science cannot operate without it. When the inhabitants of a plane have learned mental science patterns, then they are to a great degree freed from the more regular camouflage patterns . . . the flying saucer appearances come from a system much more advanced in technological sciences than yours. However, this is still not a mental science plane. Therefore, the camouflage paraphernalia appears, more or less visible, to your astonishment. So strong is this tendency for vitality to change from one apparent form to another, that what you have here in your flying saucers is something that is actually not of your plane nor of the plane of its origins. What happens is this: When the 'flying saucer' starts out toward its destination, the atoms and molecules that compose it (and which are themselves formed by vitality) are more or less aligned according to the pattern inflicted upon it by its own territory. As it enters your plane, a distortion occurs. The actual structure of the craft is caught in a dilemma of form. It is caught between transforming itself completely into earth's particular camouflage pattern, and retaining its original pattern. What struck me more than the book's UFO stories, however, was the common thread weaving among them of breathtaking alterations in consciousness associated with the experiences -- sensations of leaving the body, of flying through the air or being "carried along by the wind," and receiving "startling and novel insights into the nature of reality" that reverberated thereafter with profound, life-changing effects. (Gardner) writes about various kinds of cranks with the conscious superiority of the scientist, and in most cases one can share his sense of the victory of reason. But after half a dozen chapters this non-stop superiority begins to irritate; you begin to wonder about the standards that make him so certain he is always right. He asserts that the scientist, unlike the crank, does his best to remain open-minded. So how can he be so sure that no sane person has ever seen a flying saucer, or used a dowsing rod to locate water? And that all the people he disagrees with are unbalanced fanatics? A colleague of the positivist philosopher A. J. Ayer once remarked wryly "I wish I was as certain of anything as he seems to be about everything". Martin Gardner produces the same feeling. There are a lot of people... who’d make you think that there’s a risk of some kind of alien invasion or threat. It’s the other way around, we’re viewed as the threat, the human civilisation right now is viewed as a very unstable civilisation that has not attained a peaceful world situation, which should have happened at the end of World War 2, and has not yet happened. So I think that these civilisations are waiting for us to grow up as a civilisation, and until then, there’s not going to be any overt action by them unless some catastrophic event was to happen. These civilisations range from hundreds of thousands to millions of years more developed than ours, and it appears that they are working somehow together in observing the planet. But the caricature of, so to say, an alien that’s been put out there, that’s mostly a counter-intelligence perspective that has been done by the CIA.... most of the information people see out there on the subject is disinformation created by the intelligence community for its psychological warfare value. Certainly, countries all over the world have a prevalent interest in having this information come out, because the big talk is about climate change... and resource depletion. The fact of the matter is, the technologies for going from one star system to another involves very advanced science and physics, that would get us off oil, gas and coal very quickly. But therein lies the problem: it’s a multi-trillion dollar economic question of bringing out this information. ...the first thing a scientist is going to say...is: what technology are they using to get here? ...when it’s answered, it’s the end of oil. ‘I’ve been a sceptic all my life’, said Adams in his report,’ but what can you do when you see something like that ? We were both flabbergasted.’ Both pilots were slightly blinded by the glare. ‘It was the strongest blue-white light I’ve ever seen,’ said Adams. People often ask, “How do you know the difference between a man-made UFO and an extraterrestrial vehicle?” It’s very obvious if you are ever close up to one, because the entire quality of it is different. The ones that are extraterrestrial are extremely advanced, in the sense that they are “awake.” The actual craft itself has artificial intelligence and is conscious. The beings on board are connected into it and can connect to you consciously. And the kind of light it gives off is like nothing you have ever seen on Earth: It is extraordinary. It looks like it is not of this worldand has an energy and intelligence associated with it that is very advanced. None of the contactees, whose accounts were not contaminated by the disinformation campaign, had anything but positive experiences to share. The message they were asked to convey... was one of empowerment for the human race: We must avoid further armed conflict if we are to prevent self-annihilation, and it is feasible to create a peaceful future through international cooperation and making sure everyone’s basic needs are met... However, being engaged in a nuclear and conventional arms race..., the Western industrial-military complex, which includes the fossil and nuclear fuel industry, felt this message was not in their interest. Governments and their military... decided in the mid-1950s that, despite the cover-up of the army’s salvaging of one or more crashed flying saucers, the contactees’ message of international co-operation for peace and brotherhood was being too well received. An indication of this popularity can be found in the fact that, within three years of its publication Flying Saucers Have Landed (1953) (full text online), the book which included George Adamski’s initial contact experience, was reprinted twelve times in the US alone and published in seven (!) other languages. On various occasions George Adamski testified to the many commonalities among the various religions as different expressions of the same truth, among which the cyclical appearance or return of a Teacher, which he did again in answer to questions posed by a minister in the audience, at his lecture in Detroit, confirming that “there have been many messiahs...” In the Wisdom teachings, in which Adamski was versed as a teenager , this cyclical appearance of a Teacher is known as the Doctrine of the Coming One, which is also evinced in almost every religion: Christians are waiting for the Second Coming, Jews are still expecting the Messiah, Buddhists await the fifth Buddha, Hindus the tenth incarnation of Vishnu, or Kalki Avatar, and segments of Islam are waiting for the return of the twelfth Mahdi, or Imam Mahdi. According to British author and esotericist Benjamin Creme, who gave talks about the spiritual mission of the Space Brothers in the 1950s, this time is no exception. He has been informing the world that in July 1977 the World Teacher for the new age arrived in London as his centre in the modern world and has since been preparing mankind and the world for his open manifestation at the earliest possible moment. Several high-profile individuals testify to the reality of visitors from space coming to Earth, confirming the experiences of the first contactees of the modern age. Science increasingly confirms the likelihood of life existing around the universe, along the lines of predictable evolutionary outcomes. All major religions share the notion of the expansion of consciousness, facilitated or inspired by the cyclical revelation of a new or returned Teacher. The original contactees were informed that humanity’s moral progress must keep in step with our technological advancement to prevent our self-destruction. If humanity is innately one, as testified by the visitors from space in their contactees’ accounts, the essence of the world’s religions and advancing scientific insights, the socio-economic inequality that divides the world today could well be seen as the manifestation of a crisis of consciousness, showing a fundamental lack of correct human relations. The Ageless Wisdom teaching posits the notion of a kingdom in nature that has evolved from the human kingdom, which consists of men and women who have evolved beyond the strictly human state – the Masters of Wisdom. As the most recent exponent of the Ageless Wisdom teaching, Benjamin Creme has been informing the world that the Teacher for the New Age is ready to make himself known to the world and inspire humanity to create a new civilization based on socio-economic justice and freedom for all.